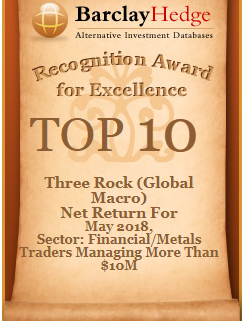 After returning 2.48% during May 2018, Three Rock Capital Management received two performance awards from Barclayhedge. The Global Macro Program ranked 8th on a net return basis out of all discretionary managers within Barclayhedge’s database who manage more than $10 million and ranked 4th on a net return basis out of all Financial/Metals Trading managers within Barclayhedge’s database who manage more than $10 million. Long US Dollar exposure was our primary focus in May and the program profitably traded the US Dollar against EUR, GBP, JPY and CHF. We anticipate that the USD will continue to recover as the economy picks up momentum and higher US yields continue to support the USD. President Trump indicated resistance late last week to, among other things, recent USD strength. In response the USD has backed off recent highs against other major currencies, falling in the region of 1 to 1.5% depending on the currency pair. While Trump’s intervention was hardly a shock it affects sentiment in the short term by reminding the market of the administration’s preference for a soft USD and raises the prospect of similar episodes in the future should the USD continue to strengthen. In addition, from a technical perspective, the USD has again backed off the upper side of its recent range. Beyond the short term however we doubt such interventions will derail USD strength and anticipate a more muted market response to further episodes. The USD has too much going for it, most obviously a substantial yield advantage against other major currencies that is highly likely to widen in the months ahead. In this context, it seems doubtful that FOMC policy will be influenced by Trump’s comments except perhaps at the margin, by encouraging higher interest rates by way of emphasising Fed independence. We view the yield advantage as a downside cushion for the USD which will continue to offer strong support. As Trump pointed out in an interview on CNBC, the Chinese Renminbi is “dropping like a rock”. The PBOC is loosening monetary policy while China is facing several major challenges from Trump’s threat to place tariffs on all of China’s $505 billion of exports to the United States to rising defaults in credit markets. While the PBOC will want to keep RMB depreciation orderly they surely expect it to continue to weaken. That this happens will be important for USD sentiment globally. We exited USD longs in response to headlines from Trump’s CNBC interview but will be looking to re-enter either on a pullback towards the ‘cushion’ or on a break to new highs.